Blood, guts and Spartans, the epic Spartacus: War of the Damned is coming to DVD and BluRay next Monday. The blood soaked saga reaches its epic conclusion following Vengeance and Blood and Sand. The series was inspired by the historical figure of Spartacus (played by Liam McIntyre), a Thracian gladiator who led a major slave uprising against the Roman Republic. And the gladiators of Rome do not hide their love of blood, guts and glory for season 3. Make sure you catch the grand finale available to pre-order now. Is SPARTACUS done and dusted then? Will it come back in any way shape or form.. Can you give us some sort of hope? On SPARTACUS – Have you been surprised it’s got as popular as it has got? You must have enjoyed working on Spartacus? 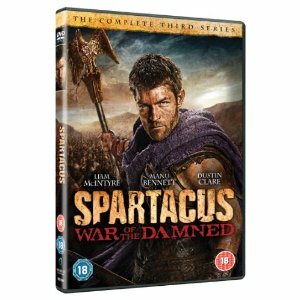 The epic final season of the TV Series SPARTACUS: War of the Damned will be available to own on DVD and Blu-ray from 29th April. Starring Liam McIntyre as Spartacus, Simon Merrells as Crassus, Manu Bennett as Crixus and Dustin Clare as Gannicus, this epic conclusion of a legendary journey also introduces a young Julius Caesar into the story, played by Todd Lasance. The SPARTACUS final series “War of the Damned” will unleash a battle unlike anything ever seen before.